On the third Sunday of Advent, penitential purple gives way to pink and we celebrate “Gaudete” or “Rejoice!” Sunday. “Rejoice heartily in the Lord, says Isaiah” (61:10). “My Spirit finds joy in God my Savior,” says the Virgin Mary (Luke 1: 47). “Rejoice in the Lord always,” says St. Paul (I Thes. 5:16). 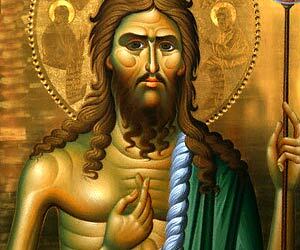 “Make straight the way of the Lord”, says John the Baptist (John 1: 23). Whoa. What’s that strident saint of the desert doing here, on Rejoice Sunday? His stern call to repentance does not seem to fit. Believe it or not, St. John is the patron of spiritual joy. After all, at the presence of Jesus and Mary, he leapt for joy in his mother’s womb (Lk. 1:44). And it says that he rejoices to hear the bridegroom’s voice (Jn. 3:29-30). Now this is very interesting. Crowds were coming to hear John from all over Israel before anyone even heard a peep out of the carpenter from Nazareth. In fact, John even baptized his cousin which launched Jesus’ public ministry, heralding the demise of John’s career. Most of us would not appreciate the competition. The Pharisees and Sadducees certainly did not. They felt threatened by Jesus popularity. But John actually encouraged his disciples to leave him and follow the Lamb of God. When people came, ready to honor John as messiah, he set them straight. He was not the star of the show, only the best supporting actor. Jesus was the one to watch. John may have been center-stage for a while, but now that the star had shown up, he knew it was time for him to slip quietly off to the dressing room. Most human beings at one time or another battle a nagging sense of inadequacy. Pride is sin’s approach to dealing with this. Proud people are preoccupied with self, seeing all others as competitors. The proud perpetually exalt themselves over others in hopes that this will provide a sense of worth and inner peace. Of course, it doesn’t. Human history has proven that time and time again. Even the pagan Greek storytellers knew that hubris or pride was the precursor of tragedy. Pride always comes before the fall, as it did in the Garden of Eden. But what about John’s stark call to repentance? How this be Good News? Because repentance is all about humility and humility is all about freedom. And freedom leads to inner peace and joy, joy in the presence of the Bridegroom.